Studio portrait of group of people posing in front of a painted backdrop. A Ho-Chunk man on the left is wearing a suit and overcoat, and a Ho-Chunk woman on the right is wearing a shawl and dark-colored dress. 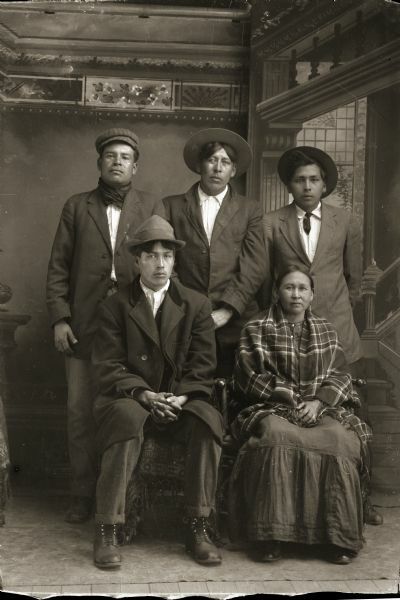 Three Ho-Chunk men are standing behind them wearing suits and hats. They are identified as John Blackhawk (NoJumpKah), seated to the left of Lucy Long-Wolf Winneshiek (ShunkChunkAWinKah). Standing left to right are Henry Winneshiek (WaConChaRooNayKah), Edward Winneshiek (NaZhooMonEKah), and George Lonetree (HoonchXeDaGah).